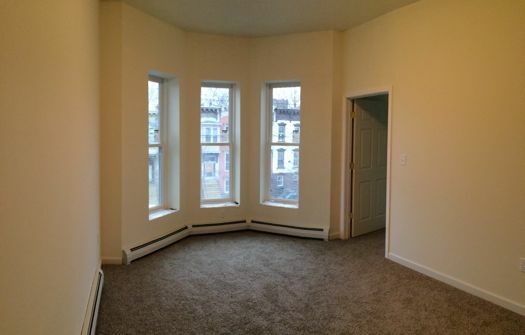 The renovated row home on Clinton Ave in Arbor Hill. When Habitat for Humanity comes up, the image that probably pops into a lot of people's minds is that of a volunteer org getting together on weekends and building small houses, one at a time. But, as we've mentioned before, Habitat for Humanity Capital District has been working in recent years as something more like a neighborhood developer, doing large-scale projects such as the ongoing redevelopment in Sheridan Hollow. 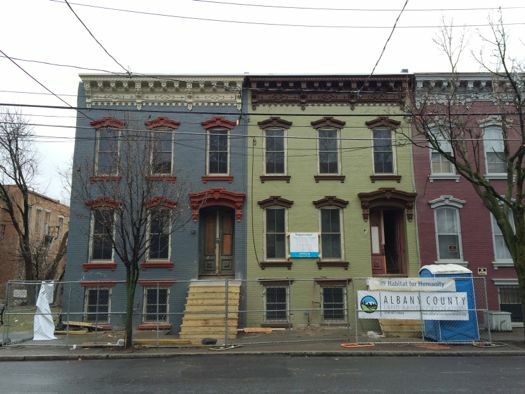 Now Habitat for Humanity Capital District is evolving again, this time working to renovate blighted buildings in the city of Albany back into owner-occupied homes. 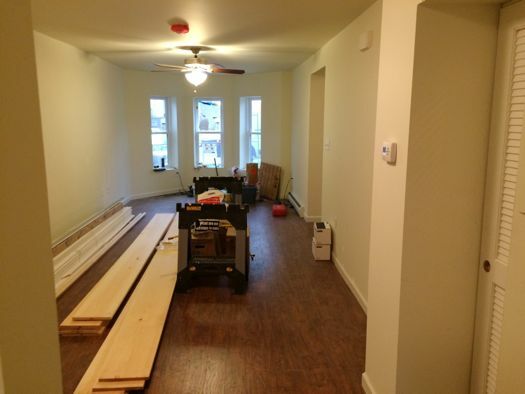 The ground-floor living room in the Clinton Ave home this past December while working was still going on. 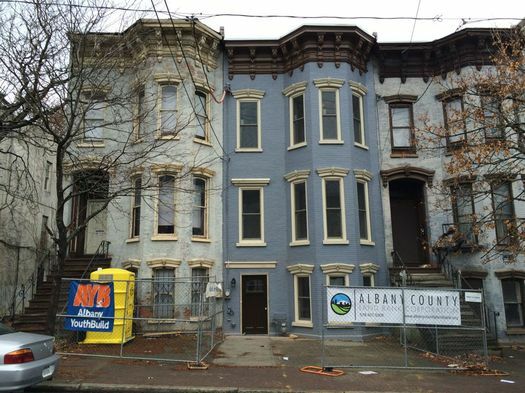 Habitat for Humanity Capital District -- which serves Albany, Rensselaer, and southern Saratoga counties -- is currently working on three rehab projects in Albany: 309 Clinton Ave, 100 Lark Street, and 102 Lark Street. These projects are in addition to the ongoing new construction project in nearby Sheridan Hollow, where the first homes in the project's second phase were recently completed. This trio of rehabs isn't the first time Habitat has taken on such a project. It completed a rehab of 126 Lark Street in 2015. But Christine Schudde, Habitat's executive director, said they're now looking to expand the number of rehabs they do as part of the org's overall strategy to comprehensively address neighborhoods. The kitchen. 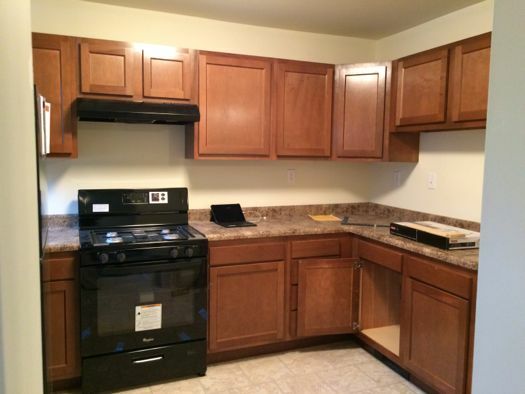 Like other Habitat homes, the finishes aren't necessarily fancy -- but they are new and nice. "So, as we're looking at how we can have the greatest impact, we do still look at new construction and that can be really transformative going forward," Schudde said during a tour of the Clinton Ave home in December, "but we want to make sure we're looking at the buildings that already exist." The expansion of this focus also matches up with the efforts of the relatively new Albany County Land Bank, which has been working with Habitat to identify and help fund properties such as 309 Clinton. The home has two upstairs levels with bedrooms. This is one of the landings. Habitat builds houses, so it has a lot of construction experience. But rehabbing buildings that are more than a century old presents its own sets of challenges. As Fred Darguste, Habitat for Humanity Capital District's director of construction, explained while we toured the Clinton Ave home in December, there's a lot of uncertainty about what exactly might need to be done -- and how that will affect the cost. "Because when you walk into a building there's just so much that you can see with the walls up," Darguste said. "And when you start taking down the walls, the structural issues always bring additional costs that you didn't factor in -- regardless of how much a contingency you put in there." But Darguste said they go in expecting that they're going to find some things that are unexpected, and Habitat relies on its team of project managers to forecast potential problems so they're not too much of a surprise. One of the bedrooms. Darguste said the building had previously been used as a single-room-occupancy boarding house and was split up into a bunch of tiny rooms. The new restored bedrooms are spacious, with big closets. Another issue involved with rehabbing old buildings is navigating some of the requirements related to historic preservation. 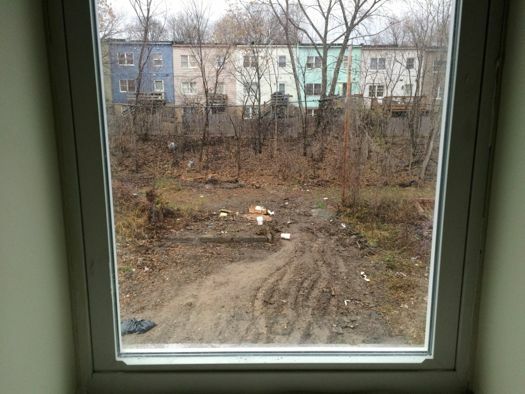 One example: Replacing wood windows that have suffered from decades of neglect with their modern equivalents can be expensive, and in the case of a Habitat project, doing so would probably be outside the budget. "We do want to maintain the integrity of the building and the history of the neighborhood," said Christine Schudde. "But rehabs are already really expensive, so for us to be able to rehab a building and to keep it affordable, to have that sales price be something that a family of lower income can afford -- there has to be a balance between the historic goals and leaving a building vacant, which we don't want to do." 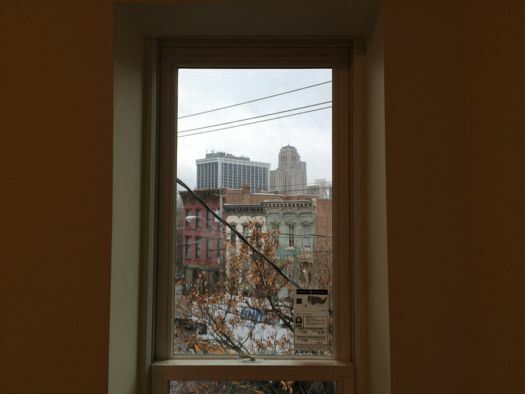 So Habitat has worked with the city's Historic Resource Commission to get approval for the use of aluminum-clad windows that are about half the price of wood-framed windows. "As a result, we're able to save money, use more durable windows, and at the same time maintain the integrity of the historic area, so it works out really well," Fred Darguste said. Colleen Ryan, the chair of the city's Historic Resources Commission, said she recalled the HRC approving the use of aluminum-clad windows in a half-dozen cases over the past year, and the commission frequently gives them the OK in cases where the original windows had been removed years ago. The windows are just one example of how Habitat works every part of the cost equation to make the rehab projects fit a very tight budget. There's a relatively big back yard -- 50 feet deep -- that will get a fence. Fred Darguste said Habitat's budget for the complete gut remodel of the 2,700 square foot, 4 bedroom, 2.5 bath row home on Clinton Ave is $140,000 -- which works out to a little more than $50 per square foot. They're able to get the price down that far by working with vendors who are longtime supporters, getting discounts from manufacturers, and of course, help from volunteers. "Everyone contributes to keeping that cost low," said Darguste. Even so, that $140k cost is above the $125,000 price at which Habitat will be selling the home to its new owners. (The family is going through the usual Habitat buying process, which includes 250 hours of sweat equity as well as financial education.) Habitat will be covering the gap with funding from the Albany County Land Bank, as well as its usual assortment of funders. And that highlights the reality for many vacant buildings in neighborhoods around the Capital District -- the price the market will support for them is below what it would cost to renovate them. So having Habitat apply its model to renovating the buildings is a way to unstick them from this upside-down financial state. The two homes undergoing renovation on Lark Street. Albany, Troy, Schenectady, and other spots around the area have a lot of buildings -- hundreds of them -- like this one on Clinton Ave. So what is Habitat capable of -- how many buildings could it do? Fred Darguste figures Habitat for Humanity Capital District could currently handle 6-10 rehabs per year. But they'd have to be the right buildings, in the right places. "For us, density is key. It allows us to leverage our team as best as possible," he explained, noting the logistics of managing materials and volunteers are much easier when buildings are located near each other. And Christine Schudde said that approach loops back into Habitat's current aim to help blocks or whole sections of neighborhoods change their fortunes. Fred Darguste and Christine Schudde. "I think it's important to remember that, even if we could, we wouldn't want to be the only entity that's rehabbing buildings," she said. 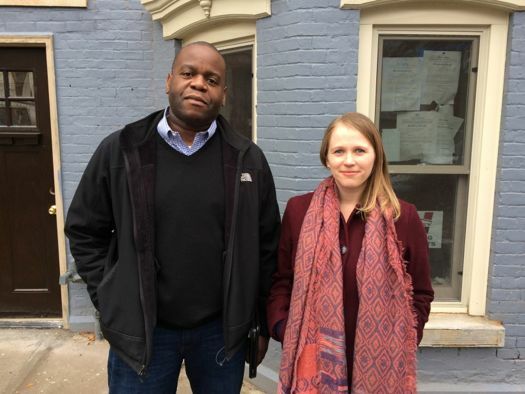 "We want to be the spark that maybe helps build the neighborhood market, that makes it possible for other investors to come in and build market rate, or keep building affordable housing, to have a mix of products and a mix of purchasers. ... We want to encourage other people to come on board and realize the neighborhood can handle this investment, it's worthy of this investment, and that there's a good future here in Arbor Hill, and Sheridan Hollow, the South End and wherever we're building." That is all great, but the reality is our nation doesn't have the money to build build new modern homes in urban areas. Rehabilitation and Historical Preservation are overrated, and our modern society is suffering. The present generations will not have a distinct urban architectural legacy, because there isn't one being built. This is awesome. There are some beautiful homes on Clinton Ave. Would be great to see them come back to life. The "upside-down financial state" of many buildings in the area is because the renovated tax bill is so high and the dilapidated/vacant/collapsed tax bill is so low. Fixing tax incentives is the number one thing the city could do to spur reinvestment in blighted areas. I like this approach to re-habbing interesting, existing stock in urban areas vs. new builds in the suburbs/rural areas where transportation and accessibility become huge costs. I have a 120 year old house, so I know exactly about the trickiness of doing an energy retrofit/rehab on an Old Beauty. I also like the "neighbourhood" building approach instead of creating one-offs. Looking at that giant backyard, I'm thinking it would be advantageous to add a carriage house - new micro homes - to add density to the site and create living options for those who don't need a whole house or have accessibility issues ie. aging parents, the disabled, etc. Also large yards require substantial upkeep (time + money). I was born on Clinton Avenue in 1961 and now live in England. I am so glad that there is to be inevestment in the area, it looked very run down when we visited in the summer. Argus is right, this is great, but an agressive and progressive approach to taxation on these buildings is also needed. This is great. 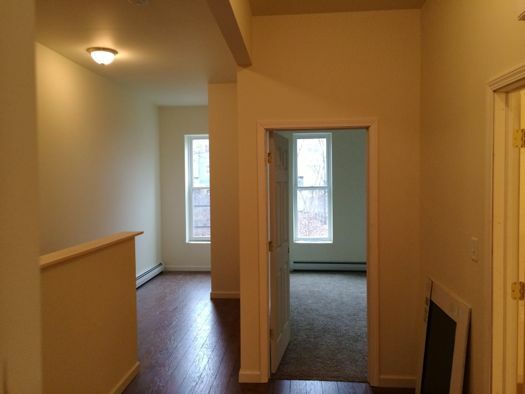 Kudos to Habitat for Humanity, the Albany County Land Bank, and the city for making it work. I have nothing against new construction, but it's nice to see older structures like these rehabbed. It's wonderful that affordable housing is being built and or rehabbed in blighted areas. I agree with the following comment made by Argus " Fixing tax incentives is the number one thing the city could do to spur reinvestment in blighted areas." I add that the incentives shouldn't primarily go to big business and or outside investors, but also to individual buyers who live in the city. I also think the owners and builders should do a better job constructing new properties. Some of their deadlines are so tight, the jobs are rushed and units are left very flawed. Things like providing enough sound proofing, making sure heating and electrical systems have no issues, and sensible placement and organization of fixtures are some of tenants' concerns. Tenants are very thankful for having a new roof over their heads, but are also aggravated that they have so many complaints about their units but not enough answers and improvements. Especially in the Sheridan Hollows area. I have donated material to Habitat in Columbia County and I applaud the Historic Resources Commission to understand an economic principle in using alternative windows other than wood. The article maybe incorrect as the picture illustrates to me the windows are vinyl not aluminum clad. Aluminum clad windows are more expensive then all wood. I've seen a couple Albany Land Bank properties pop up in my neighborhood outside of the city of Albany, but it sounds like these aren't going to be able to be Habitat projects because they are focusing on the same area. I'm a little concerned that this means they are just going to sit vacant. What does the Land Bank do with the other homes it is acquiring? Every one can pitch in to this revitalization effort. The Habitat Restore Outlets in many cities across the country will take decent used furniture, (almost) from homeowners and resell them. The monies generated help finance these projects. We recently moved and we gutted the late '60's kitchen. Habitat came and loaded all of the cabinets which were in fine shape the counters as well as the kitchen sink plus various lamps and mirrors. As they were loading their truck they mentioned to me that in 5015, the Albany habitat either built or remodeled 15 residential properties for people who wanted to own their own home. Donate, it will make you feel good.